Hollins is obviously a poor offensive player, relying on his athleticism for most of his baskets. But he is a good defensive player who plays hard. The Cavaliers were almost ten points better per 100 defensive possessions when he was on the floor. Even with his subpar offense, his defense made such a difference that they were a net 6 points better per 100 possessions on offense and defense when he was out there. Hollinger goes on to say that Hollins was outrebounded by every single player in the league except for Andrea Bargnani and Brian Cardinal. He worked out all summer with Kevin Garnett and KG is a big fan of Hollins. KG talks about his work ethic and the way he approaches the game. Also apparently KG had a hard time making friends and Hollins seems to be there for him in that respect. “Summertime’s the time when you’re working on things, but for me, I don’t make a lot of friends, and I can say that I made one in him. I like the way the kid approaches the game. He wants to be more than good. You see it in his face; you see it in his work ethic. I’m a big fan of his, so I’m glad he’s here.” KG’s not the kind of guy who throws around praise about people he’s played against. I’m sure Danny Ainge factored that in when he was looking for big men to sign. Hollins is an interesting player because he’s a high flying 7 footer who can’t rebound. He looks good running the floor, especially with Rondo running the point. He will definitely help the Celtics on the defensive end and give KG’s knees a break from banging in the post for 40 minutes every night. If he could develop some sort of offensive game or rebound a little more. He could be extremely useful to the Celtics. He sometimes needs to keep his head, he got a technical in the first two minutes of his time with the Celtics, but there nothing new for a team with Rondo and KG. Not a bad move by the Celtics, personally I was really hoping for Fesenko, but Danny Ainge could do a hell of a lot worse. Although it has already been around the rumor mill since last weekend, it has now become official: Austin Rivers is heading to the NBA. Rivers was a unanimous choice for ACC Rookie of the Year. Usually, I would disregard anything about Du ke, but since it is the son of Boston Celtics coach Doc Rivers, it is hard not to say something about. Don’t get your hopes up, though, Celtics fans. Chances are, he won’t make it till our pick. So I’ve been doing a lot of reading on the internet about the Patriots recently and there have been a lot of fan questions about the Patriots and primarily their most recent offseason moves so I figured it was worth my time to put together an article answering some of the most frequent questions. What are the Patriots plans at the Wide Receiver position after their most recent signings? The Patriots have made several Wide Receiver moves so far this offseason; with the most notable move being the signing of Brandon Lloyd. The Patriots have an abundance of bodies at the receiver position and clearly they all won’t be able to be on the roster come opening day. What their exact plan is no one can tell. Chad Ochocinco restructured his contract recently to take a pay cut, which in my eyes would be viewed as a sign that he might be back for round two. Anthony Gonzalez is frequently injured but when healthy has potential to be a solid option. The re-signing of Deion Branch was a surprise to me, especially after the signing of Lloyd. I’m not convinced Stallworth will make the team but even that is still a possibility. The bottom line is someone has to get cut/traded. It hurts to even think about it; but with the depth the Patriots have at the position now it could be an option that Welker is traded or released. In no way am I saying Anthony Gonzalez is Welker talent, but if he can get the job done at the same position as Welker I don’t see a purpose in paying Wes over $9mil this season. I believe a lot of the restructured contracts could be leading to a record breaking deal for Gronk. Even without Welker Brady will have plenty of options to go to so if you can use the money elsewhere (AKA defense) I would certainly do it. Who will carry the load for the Patriots at Running Back? With Green-Ellis signing with the Bengals the Patriots are left without any experience at the Running Back position. Ridley showed flashes of talent but is fumble prone and that certainly won’t fare well with Bellichick if it continues. Shane Vereen may be a viable option if healthy also. Woodhead is certainly not an every down back in the NFL either. Don’t hold your breath that the Pats will sign that every down back everyone has hoped for since the retirement of Corey Dillon. The Patriots will more than likely use a running back by committee type of game plan which isn’t anything new to them. I’m assuming the Patriots will bring in the Sammy Morris or Lamont Jordan type of veteran to take a few carries and add depth to the position, but don’t expect much. The Pats don’t rely on the run game like some teams so I don’t see this being a major concern. What will the Patriots do with their four picks in the first two rounds? My bet is the Patriots will more than likely trade one or two of the picks like they always do. Something like one of their first rounder’s this year for a third this year and a first next year. Let’s say the Pats change their style up a bit and use all their picks. Pick No. 27 : The Patriots will more than likely address the defensive side of the ball early and often in the draft so here are a few of their options with this pick. Gilmore has good size for a corner standing at 6’1” and has experience at the college level. He lacks elite speed but with the right coaching he could get by with what he has and be a solid NFL cornerback. Perry is a solid pass rusher and would be a great fit for the Patriots 3-4 defense. Pick No. 31: The Patriots will probably stick with defense with this pick. I’m thinking they go with a linebacker and then some secondary help with their first two picks. Barron has serious talent and was one of the best safeties in the country as a sophomore two years ago. Barron is a three year starter and could be a steal at this pick. He is a hard hitter and has good size for a safety. If Barron is still here I don’t see any way the Pats take anyone else. Pick No. 48: The Pats will probably also go defense with this pick. They have many holes on that side of the ball. Curry has a great combination of speed and size which makes him a very versatile player and that is something Bellichick loves. Curry put up phenomenal numbers in college but those stats can also be skewed seeing as he played in a weak conference. If the Pats don’t take a safety in the first round expect them to take one here. Smith is a smart player who doesn’t get beat deep often. The Bruins took care of business against the Ducks last night and Marty Turco earned his first W as a Boston Bruin with some fine play in net. Last night’s game wraps up the Bruins three-game West coast road trip (2-1-0) with the B’s coming back to Boston for a Tuesday night game with the pesky Lightening. With only a handful of games remaining in the regular season, it looks like the Bruins will nab the number two or three seed in the Eastern Conference. Last night, Big Z, Pouliot, and Brian Rolston all tallied goals. Rolston’s goal was particularly nice because it resulted from a nice breakout pass, some fancy footwork and nice feed from Chris Kelly. From there Rolston delivered a snipe pass Jonas Hiller that rang the post and then in. The Kelly-Pouliot-Rolston line has been effective since Claude has put them together and I would expect to see that line continue to stay in-tact even with Rich Peverley’s return to the ice for two reasons. First, the KPR has been good over the last couple games, finally getting Rolston involved, and secondly having Peverley and Marchand as Bergeron’s two wingers makes for a dynamic line with a lot of speed to burn. Final 4 is Finally Here! If you somehow missed any of the games this weekend, you missed quite a bit. The box scores do not do these games justice. Especially in the Kentucky game. Baylor went up 10-5 right out of the gate, but that was short lived as the Wildcats came back and exploded for 16 straight points. The final score was 82-70, but it was much more lopsided than that. Kentucky is going to be a tough team to beat. Anthony Davis is going to be the #1 pick, and for good reason. He played amazing once again with 18 points, 11 rebounds, and 6 blocks. He even played when the game was a lock at the game, risking injury. This team looks amazing day in and day out. They will take on Louisville who they already beat by 7 points on New Year’s Eve. I think this should be an easy win for Kentucky but you never know with Rick Patino on the other side of the court, he just needs to come up with a game plan to shut down 4 of the best players in the league. Easier said than done. Kansas is tough as well, with most likely a #2 pick Thomas Robinson scoring 18 points and Tyshawn Taylor dropping 22 points, 6 rebounds, 5 assists, and 5 steals. They were able to take down the Tarheels with a strong finish to the 2nd half. They will take on Ohio State who is led by Jared Sullinger, coming off a big game against Syracuse. He has 19 points while grabbing 7 boards. I picked Ohio State to win last year but I think that Kansas will take this one. With the loss of Fab Melo, many people wondered if the Orange would even beat 16 seed UNC Asheville. The Orange advanced after a tough fought game with the help of some questionable officiating. In the round of 32, the Wildcats of Kansas State put up a fight against the Orange but the depth of the Orange proved to be too much in the end, as Dion Waiters and James Southerland combined for 33 points off the bench. Despite these two victories, the Orange are still seen as the most vulnerable of the number one seeds. Tonight’s matchup against Wisconsin will be a true test for the Orange. The Badgers come into this game with the 4th ranked defense in the country and on paper, look to be a great matchup for Syracuse. Wisconsin is very stingy with the basketball, coming into this game averaging the second fewest turnovers per possession in the nation, and this will truly prevent the Orange from capitalizing on turnovers and getting easy buckets off of fast breaks. Syracuse will most likely have to score in their half-court offense which is not an easy task against the Badgers defense. Expect this game to be a low scoring game, with Syracuse only scoring 70 points or better 4 times in their last 13 games and the Badgers only giving up and average of 53 points in their first two tournament games. For the Orange, Scoop Jardine and Kris Joseph are the two players that will need to step up if they are going to advance to the elite 8. Both of these experienced players have played in big games and know what it takes to win in the NCAA tournament. The Orange will be successful if they can produce good ball and player movement and not settle for jump shots, and their success starts from these two seniors. For the Badgers, Jordan Taylor will have to have a big game and the defense will need to continue to be strong. Although Taylor has not been as productive this season as he was in his junior season, with a .402 field goal percentage, .359 three point percentage, and a .785 free-throw percentage, the Badgers are in the same position as they were one year ago, the Sweet Sixteen. If the Badgers continue to take care of the ball and keep the Orange’s offense in front of them, they will have a good chance of advancing to the Elite 8. The Big East Champion Louisville Cardinals will face their biggest test yet as they come up against Michigan State number one seed Michigan State in the Sweet Sixteen. The Spartans will enter the game minus an important role player in freshman guard Branden Dawson. Dawson has been huge in piling up hustle points for the Spartans and his loss will provide an advantage for the Cardinals. The player for the Spartans that has to step up in this game will be Draymond Green. Green is averaging 20 points, 12.5 rebounds, and 8 assists in the tournament, leading the tournament in scoring. The Spartans have been a second half team so far in the tournament shooting 64.2 percent in the second half in wins against LIU Brooklyn and Saint Louis, but the Cardinals may jump on the Spartans early if they get off to a slow start. For Louisville to win this game it is going to have to come from the defensive end. The Cardinals play as hard on defense as any team in the country with Gogui Deng being a force in the paint and great guard defense led by Peyton Siva. On the offensive side of the ball, Siva has been averaging 9.2 points per game and 5.5 assists per game. He will need to continue to get his team involved if the Cardinals are going to pull off the upset. The Cincinnati Bearcats are coming off of a huge win over the ACC Tournament champion Florida State Seminoles and will need to continue with this momentum if they are going to upset Ohio State. With Fab Melo out, The Buckeyes have quickly become the favorite to reach the Final Four from the East Region. Cincinnati has played well as of late, reaching the finals in the Big East Tournament and defeating Texas and Florida State in the first two rounds of the tournament. One of the most intriguing matchups in this game is going to be the matchup between Yancy Gates and Jared Sullinger. Gates and Sullinger are averaging 9.2 and 9.3 rebounds per game respectively, and whoever wins this big man matchup is going to give their team a huge advantage to win the game. I would give the edge to Sullinger in this battle. Sullinger possesses a point scoring ability that Gates does not as he is leading his team and averaging 17.6 points per game. He has flown under the radar for much of this season and is much better than people are currently giving him credit for. Each of these teams has the chance to bring Ohio its first men’s basketball title since 1962. In the round of 32, Marquette beat a very good Murray State team who did not get as much credit as they deserved. Darius Johnson-Odom and Jae Crowder is one of the best duos in the country and they have shown this throughout the tournament. Each of these players were finalists for the Big East player of the year, an award that Crowder won. A key to the game for the Golden Eagles is not Johnson Odom’s offense, rather his defense. Florida’s offense is run around ball screens and spacing along the three point line with very minimal post game. Florida shoots more three point shots than most and for Marquette to slow down their offense Johnson Odom has to come up big defensively. For Florida the key player is Kenny Boynton. He is averaging 16.3 points per game and has been Florida’s most consistent player all season. He will have to have a big offensive night if the Gators are going to beat Marquette. Florida’s defense will also be a huge factor in determining their success. The Gators have struggled at time this year when they were shooting poorly from behind the arc because they could not get stops or force turnovers. However, in their two NCAA tournament wins so far they allowed their opponents to a .71 and .77 points per possession. The Golden Eagles are very capable of scoring in bunches and the Gators will need to play tenacious defense once again to stay in this game. 1822 – The city of Boston, MA was incorporated. 1983 – Northampton, MA – The first women’s collegiate basketball game was played at Smith College. 1904 – A patent was issued for a “baseball catcher”. 1934 – The first Masters Golf Championship began in Augusta, GA.
1953 – The Boston Celtics beat Syracuse Nationals (111-105) in four overtimes to eliminate them from the Eastern Division Semifinals. 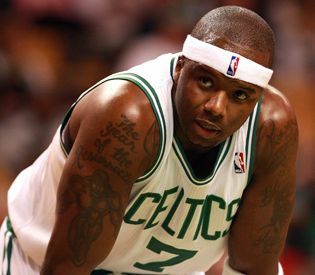 After the season ending injuries to Chris Wilcox (heart) and Jermaine O’Neal (wrist), the Celtics are in desperate need for another big man. Kevin Garnett and Brandon Bass have been playing well as of late, but the Celtics need to find depth for the two injury-prone big men. People were split whether or not Danny Ainge should have made a move for a player during the trade deadline, but I am personally happy that he didn’t. These players are on the Celtics radar for late season pick-ups before the deadline this Friday. The well-travelled Powell has played for six teams in six seasons in the NBA, the last coming with the Hawks last season. John Hollinger says that he is an effective pick-and-pop forward much similar to Brandon Bass. On shots over 15 feet he shot 43% for the season. 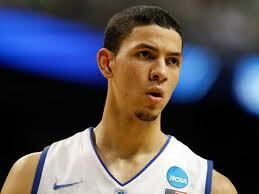 He is a good team defender who would fit well with the Celtics but can be overmatched in one-on-one situations. Powell had the second-worst turnover ratio for power forwards. He does not get steals or blocks as he ranks in the bottom five for both categories. He is not a bad rebounder and would definitely help the Celtics on the glass for the rest of the season. Powell is an inexpensive player who fits into the regular offense with his pick-and-pop ability. 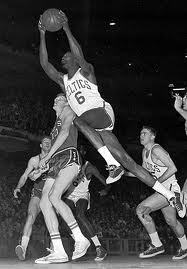 He also helps with the interior rebounding and the Celtics mantra of team defense. While his athleticism is not great, he will be able to get up and down the court with Rondo. It has been a tough season for Turiaf as he has only played four games due to a broken hand suffered on New Year’s Day. He was thrown into the Nuggets – Wizards trade to balance out the deal. He was then cut to make room Wilson Chandler who came back from China to resign with the Nuggets. Turiaf is a high energy player who is a great defensive player and hustles all around the court. He like any other Celtics big man has injury problems and struggles with rebounding. He ranked 63rd out of 67 centers in rebound rate last season. He is extremely unselfish and is known as a one of the best big man passers in the game. While he does not shoot that often, he shoots around 40% from 10 feet or more. Defensively he is the polar opposite of Powell as he ranks high in both blocks and steals per minute but struggles with rebounding. Turiaf would obviously be help for the Celtics as he would provide another body that can space the floor. His passing and intensity would help, but he seems a little too similar to the other players the Celtics have signed so far. He also wants a good contract and guaranteed playing time. Hollins is the most interesting player on here. He would be great in the open floor with Rondo as he stands 7 feet tall and can jump out of a building. But as it is with every big man on the market, he is a terrible rebounder. His rebounding stats are worse every other frontcourt player other than Andrea Bargani and Brian Cardinal. Per 40 minutes played, he would only average 6.6 rebounds. Rondo standing a full foot shorter averages 5 per 40 minutes. He’s not too bad of a pick and roll man, and also he is an above average defender who can go out and hedge against pick and rolls with his athleticism. It would be an interesting signing and definitely fun to watch Hollins run up and down the floor with Rondo. But he would have to work on his rebounding. The Celtics get outrebounded almost every game; this would add another 7 footer who doesn’t like to rebound. I wouldn’t hate the move, but not going to be the difference for the C’s. Honestly, I haven’t figured out why the Celtics haven’t made a move for Fesenko. I love everything about him as a backup center. He struggles with foul trouble and isn’t the greatest offensive player (or really average player for that matter), but he brings size and defense to the Celtics that hasn’t been seen since we sent Perk to Oklahoma City. John Hollinger says that Fesenko’s defensive stats were the best kept secret in the NBA. Last season, the Jazz were almost 12 points better per 100 possessions with Fesenko on the floor. I would love for the Celtics to add Fesenko. Teams have been playing just the tip with him this whole season and almost signing him, but I would love for the Celtics to give him a shot. He’s not afraid to do the dirty work and right now, we need a guy who can just do that. KG needs a guy to back up his talk like Perk used to. I want Fesenko on the Celtics. Obviously his offensive game is horrible (see free throw percentage) but can he be much worse than Shaq was with no legs last season? Boris Diaw – Overweight, great passer, who looks like he is going to sign with either the Spurs or the Dallas Mavericks. The Celtics aren’t a great fit as Diaw’s skill set doesn’t fit too much with their plans. Chris Kaman – Everyone thought that Kaman would be bought out and heavily pursued by both the Heat and the Celtics. But Kaman is still on the Hornets and actually had 20 points with the game winning shot against the Nets. It’s looking more and more like he is going to stay with the Hornets for the remainder of the season. The best two moves for the Celtics would be to sign Turiaf and Fesenko. Hollins isn’t a bad fit either as he would get up and down the court with Rondo, but Turiaf and Fesenko are two defensive minded players who will set picks for Ray and Paul and bring some toughness back to the Celtics. The Celtics need to reestablish their identity and these two signings would be the beginning to bringing back the toughness to the Celtics. With the Sweet Sixteen tipping off tomorrow, and our college writer on spring break, I figured I’d share this NCAA tourney infograph from CSB Sports. Enjoy.